Why Choose New Jersey for Online Higher Education? A report from the Georgetown Center on Education and the Workforce projects increasing educational requirements for jobs in New Jersey, with an anticipated 68% of jobs requiring some postsecondary education by 2020. Data from the 2017 American Community Survey shows that 61% of New Jersey residents hold some level of higher education. Prospective students, both in state and out of state, should consider online universities in New Jersey. The state offers a variety of top online programs; this guide includes a ranking of the most affordable online colleges in New Jersey. Although one of the smallest states, New Jersey offers a variety of top distance learning options. There are 88 fully online programs in New Jersey, with 14,242 undergraduate; 8,003 graduate; and 139 international students enrolled. These online classes provide opportunities for many demographic groups, including single parents, full-time workers, underserved populations, and those working in shrinking labor industries. The cost of attending one of the best online colleges in New Jersey varies. In-state students pay cheaper tuition than nonresidents. This usually proves true for online and on-campus students in the state. However, out-of-state students in some neighboring states qualify for reduced tuition rates due to reciprocity agreements. To qualify for in-state tuition, students must reside in New Jersey for one year prior to enrollment and show proof of residency. This includes a certified New Jersey resident income tax return, a lease or deed to a New Jersey home, or a New Jersey driver’s license. The data below includes a comparison of in-state and out-of-state New Jersey tuition rates. Students in New Jersey pay more than the national average for higher education, particularly for in-state tuition at four-year public institutions. On-campus and online programs in New Jersey typically offer similar tuition rates, but rates vary by school. The following information includes some sample online costs per credit for three types of online schools in New Jersey. Nonresident students considering one of the online colleges in New Jersey should consider the number of exclusively online students in New Jersey, the existence of reciprocity or good neighbor discounts, and state agreements or attendance restrictions for online learners. While many states hold membership in regional interstate compacts, which help students in qualifying neighboring states afford the cost of out-of-state tuition, New Jersey does not participate in any regional interstate compacts. New Jersey does participate in the State Authorization Reciprocity Agreement (SARA) through the New England Board of Higher Education. SARA establishes national standards for postsecondary distance education programs that member states agree to follow. SARA makes it easier for students to take online courses offered by schools in other states. Not all states belong to SARA, and membership is voluntary. Prospective out-of-state students who live in a state that participates in SARA can take online courses from New Jersey schools. To find the best accredited online colleges in New Jersey we used a variety of metrics. Some of the factors we analyzed include program offerings, reputation, and cost of attendance. Use this guide to help find the right school for you. With a mission to contribute to the medical, environmental, social, and cultural well-being of New Jersey, Rutgers University-New Brunswick is the premier public research college in the state. There are 30 schools housed within Rutgers, offering academically rigorous and research-based teaching to students who want to pursue the arts and sciences. Rutgers is also one of the best online colleges in New Jersey, with distance learning courses in areas like business, nursing, social work, communications, education, and biomedical engineering. Most of the online degrees are master's degrees, designed for either a combination of classroom instruction and online learning or a fully online course of study. Rutgers Health is the clinical service branch of Rutgers University. It combines patient care with medical research and education to provide high-quality, cutting-edge care to New Jersey residents and real-world instruction to Rutgers students in the biomedical and health fields. Across its five campuses, Rutgers offers a range of residence options for on-campus students; students can even choose to live in residence communities that bring together Rutgers students with similar interests. Rowan University offers a wide range of majors, but it is also the only college in New Jersey with a college of osteopathic medicine. Promoting and supporting research is a key priority at this college, whether it's by identifying funding sources, making sure research standards are high, or reporting research findings. Rowan's programs have a strong engineering and medical focus, with specific colleges for biomedical studies, health sciences, health professions, and medicine. Students interested in earning online degrees in New Jersey will find graduate degree options, undergraduate degree completion courses, professional development resources, and business services through Rowan Global, the university's distance learning initiative. Online learning students have access to nine of the university's 14 schools and colleges. For on-campus students, Rowan's Glassboro campus has eight residence halls and five apartment communities, as well as 11 on-site dining options available. Thomas Edison State College has a campus of eight buildings, but most of the students enrolled at this university are working remotely to earn online degrees in New Jersey. Active duty military members or veterans make up a large part of the student population at Thomas Edison State, and the college offers programs that were developed with each branch of the U.S. military. Students can choose to complete a degree or earn an undergraduate, graduate, or professional certificate in over 100 fields of study. Many of these degree programs are available entirely online, and designed to accommodate the shifting locations and schedules of military personnel. Course structures vary depending on each student's learning style; you can choose whether to take a more self-directed course of study or interact with peers and experts. Thomas Edison State also administers exams for students who wish to earn credit for what they have already learned in their area of study. This FAQ answers some common questions about New Jersey’s online programs and schools. 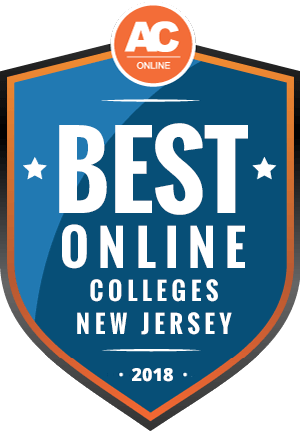 Use these resources to help you choose an online college in New Jersey. Do Online Credits Cost More or Less in New Jersey? The cost of online credits can vary, but students taking online classes in New Jersey typically pay the same cost per credit as on-campus learners. However, in-state and out-of-state students may pay different tuition rates. Which New Jersey Schools Accept the Most Transfer Credits? Most online New Jersey schools accept transfer credits from regionally accredited colleges. The amount of transfer credits accepted varies by school. To find out how many credits will transfer and to learn about course equivalencies, students can contact schools’ offices of admissions. Another good resource for transfer students is NJ Transfer. There, students can learn about the process of transferring from a state community college to a four-year institution in the state. Will Any Online Colleges in New Jersey Accept a GED? Most New Jersey online colleges accept applicants that hold a GED. The more competitive universities may prefer students with traditional high school diplomas, however. Some of the online colleges in New Jersey that accept students with GEDs include Rutgers, Rowan College at Burlington County, Mercer County Community College, and Thomas Edison State College. How many academic terms per year do online colleges in New Jersey offer? Most online colleges in New Jersey follow the same academic calendar as their on-campus programs, with start times each semester. Some online universities in New Jersey that offer more frequent start times include Walden University, Purdue University Global, and Southern New Hampshire University. Depending on the program, these schools may offer start times as frequently as once a month. Which Online Colleges in New Jersey Will Accept the FAFSA? The Free Application for Federal Student Aid (FAFSA) helps the government determine student eligibility for federal financial aid. This includes things like grants, scholarships, work-study programs, and student loans. Individual universities use students’ FAFSA information to determine their financial aid packages. Most accredited nonprofit colleges in New Jersey accept the FAFSA. Are There Any Free Online Classes I Can Take From New Jersey Colleges? A variety of colleges in New Jersey offer free online classes to anyone with an internet connection. Some free online courses allow students to earn certificates of completion. Many learners find it helpful to take free distance courses to see if they like the learning format before committing to pursuing an entire degree online. Rutgers University offers numerous free online courses in topics like supply chain management, social media data analytics, and revolutionary ideas. How Can I Find the Online Program Options at New Jersey Colleges? Prospective students can find online program options at New Jersey colleges by looking at the State of New Jersey’s Office of the Secretary of Higher Education website, which includes a list of all the colleges and universities in the state. This website also includes an inventory of program offerings in the state. Students who need help paying for online degrees in New Jersey should start by applying for Pell Grants. Those who do not quality or who seek an advanced degree can find scholarships specifically for schools in New Jersey. New Jersey offers this scholarship to spouses and dependent children of New Jersey residents killed in the World Trade Center attacks in 2001. Recipients must be full-time undergraduate students with satisfactory academic progress in their program. Students must apply for the scholarship within eight years of their high school graduation. New Jersey’s Schools Development Authority funds this scholarship for females and members of minority groups to use at any of New Jersey’s colleges, trade schools, or vocational tech schools. Applicants must file the FAFSA and make less than $60,000 a year. Applicants must be New Jersey residents. The highest achieving students in New Jersey qualify for this scholarship program. Learners receive free tuition at their college for up to 18 credits per semester, for up to five semesters. Students must rank in the top 15% of their junior or senior high school class. New Jersey awards this valuable scholarship to surviving spouses and children of New Jersey law enforcement officers, firefighters, and emergency service workers killed in the line of duty. Students must enroll at least half-time in an undergraduate program at a participating New Jersey college or university. The New Jersey Higher Education Student Assistance Authority gives out grants to students enrolled in at least six credits at a participating New Jersey community college. Students must fill out the FAFSA or New Jersey Alternative Application and make an adjusted gross income of no more than $45,000.